Each January, we celebrate the ups and try to learn something from the downs that we had to deal with over the course of the past year. In 2018, the highs far outweighed the lows so, in keeping with last year's tradition, we decided to share with you our brief recap of 2018. 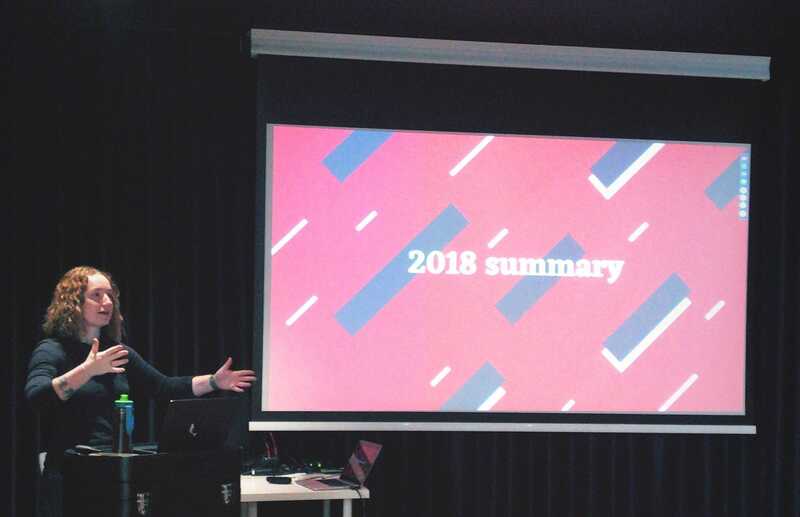 We began drafting the roundup at one of our weekly all-hands meetings, then boiled it down and distilled it into the eleven points you’ll find below—a concise outline of what happened at Monterail in 2018 and why, how we grew as a business and as a technology provider, and how much fun we had doing it. Wanna take a ride down memory lane with us? Strap in and let’s go. In what turned out to be the biggest highlights of the year, we managed to define our company’s core values and mission statement. Although it was the first time we ever put them to paper, the truth is that we lived and breathed them in our daily work. They informed our recruitment process and drove our work with clients. But having them written down really helped us bring our minds together and keep us on the path to delivering meaningful software. Monterail was ranked in Financial Times’ 2018 FT 1000, a list Europe’s fastest growing companies! That’s a valid reason to celebrate, isn’t it? The FT 1000 lists companies from thirty-one European countries that have achieved the highest compound annual growth rate in revenue between 2013 and 2016. After eight years on the market, we still have the drive to develop our team, seek out fascinating projects, and find joy in our work. We’re happy to have made the cut to be included among the most dynamic technology companies in the region. Kudos to the whole team for that. Let me make one thing clear—we have Ruby on Rails in the logo and we still love this language, but we’re also enthusiastic about new technologies and possibilities they bring along. This is why we embraced Vue.js soon after its release and why we remain one of its biggest supporters. This is also why we added Node.js to our tech stack and explored it in depth while building a modern messaging app and dealing with legacy code for Admyt. Last year we also started our journey with Progressive Web Applications. The year 2018 was a year of many firsts—it marked the first time we used Event Sourcing, a popular but quite challenging architectural pattern, in three projects, one of which was based fully on the pattern. When it comes to DevOps, we started going beyond Heroku by using AWS and Google Cloud. According to forecasts, 2019 will be a year of mobile, just like its predecessor. Never ones to drop the ball, we kept up with global trends and built a couple of mobile apps with React Native—one of which is already available in the App Store. Last year, we smashed right through our goals and signed a record number of new clients. Twenty-one new companies, both SMBs and enterprises, some of whom came in with multiple projects. Overall, we launched thirty-six new projects, big and small, for clients from a variety of fields, including healthcare, manufacturing, and law services. New business accounted for 46% of all 2018 revenue, compared to 28% in 2017. Yay! And although we stood up a dedicated Business Development team just last year, they poured their hearts into their work and made stellar gains in marketing and sales. With Joanna Trochimiuk and Joanna Śpiak joining the Account Managers team, we were able to provide even better customer care. Our Marketing team grew with the addition of Content Specialist Joanna Staromiejska and Web developer Michał Porada, who now also contribute to the effort to scale our operations. Fun fact, both were in the top 2% of all candidates applying to Monterail. Throughout the year, we took every opportunity to develop our skills, network, and enrich communities we are involved with by taking part in a number of conferences and meet-ups. Some of them, such as the React Native conference, were so inspiring that we decided to share the most important takeaways with our readers. But we also took care to grow our own events. We hosted Meet.js events at our offices nearly every month. But what’s even more exciting is that we started making regular appearances on the bigger stages, too. Our Head of Design, Paweł Hawrylak, spoke at Product Development Days and the Beauty of Data. Our co-founder, Szymon Boniecki, took the stage at the Software Development Association Poland (SoDa) summit, which brought together over a hundred software development experts from Poland under one roof. To facilitate a more structured approach to personal growth, we introduced Self Development Time, which gave every employee 2 hours per week to spend on whatever they like for personal development. In some cases, however, two hours were simply not enough to satisfy the drive for knowledge some of us showed. So, in order to develop all that creative energy, we launched our Initiatives program. The program gives time to everyone in the company interested in improving their skills through meaningful research projects and micro/small/big projects. Some of the projects launched under the program were later used to overhaul or improve processes inside the company. And all of them are open so basically everyone could have contributed if they wanted to. Tech List / Descriptions—we wrote down a list of the most important technologies used by the company and appended each entry with an informative description to provide Sales/Accounts teams with better info and relevant contexts. Software Architecture Meetings—at the meetings we discussed patterns and antipatterns, current issues in projects, and held what we called “F_ckup Sessions.” Some of the hottest topics included Serverless, GraphQL, Event Store, and Hanami. Learning Elixir—a relatively large study group met every Friday to learn the hot new language. As a result of it, we managed to introduce Elixir to a key part of one of our client’s application. One of the most important lessons we’ve learned about inbound marketing in B2B is this—it may take a LONG time to see the ROI you’d expect. Although our Vue.js-centered promotional efforts date back to December 2017, it wasn’t until six months back that we only started seeing exciting returns on our investment. Frankly, they truly were exciting—the Vue.js-oriented marketing campaign ended up bringing in contracts worth 3.2M PLN (€750k). And we were proud to share our experience with the wider audience during a "Marketing na Żywo" event at our offices and the SoDA event mentioned above. Remember our expansion in 2017 when Monterail added 278 square meters of new office space? We’ve always known that improving office space is crucial for company wellbeing, so we decided to make workplace strategy an important part of the company’s overall strategy for the future. We were helped in this venture by Dr. Karolina J. Dudek, a sociologist who performed an in-depth spatial and cultural study of Monterail. The whole experience of creating and implementing Workplace Strategy became the remedy for our problems. As a result, Monterail case study was included in "Design the workplace experience and get ahead of the future" as the example reflecting company culture and flexibility in the office space. The report was launched by BNP Paribas Real Estate Poland. Upon the official release, our co-founder Szymon Boniecki, together with other enterprises’ members participated in the press breakfast discussing workplace-related issues and experiences. Proud of that! 110% more sessions on the blog itself. Credit for these striking metrics, however, is owed to much of the company. Nearly a quarter of our staff appeared as authors on the blog, a testament to the spirit of teamwork that we’ve been trying to cultivate. And so we decided that the contribution warrants some kind of official recognition—Zuzia Kusznir, whose post was our most popular in 2018 and brought in 8.4% of all traffic on our website, received the title of 2018 Blogger of the Year 2018 while the rest of authors got pizza! Monterail co-founders, Bartosz Rega and Szymon Boniecki, turned out to be as good as TV stars as they are software house heads. The duo was featured in a TV series on startups and entrepreneurship in Poland called Startup Generation, available on Canal+ Discovery. They spoke about their experiences with launching a new business, the ups and downs of entrepreneurship, and warned viewers against repeating the mistakes they made themselves. All in all, it was good to see that the same sparkle we began with is still there and still keeps driving us forward, as we’re in it for the long haul. No recap would be complete without a mention of the downtime between periods of hard work. In 2018, we had a couple of team outings and offsites, including a weekend company retreat, a Halloween party, and a Christmas party. 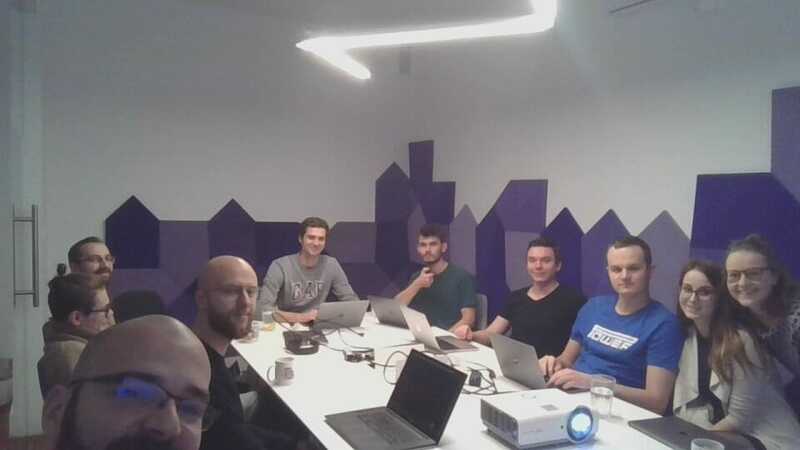 We also continued with our monthly company hangout sessions. Countless hours were spent laughing, playing games, talking about everything and nothing, some of us were even singing. Basically, we were making priceless memories together. In our view, helping others counts as fun, too—2018 marked the third time we participated in a charity initiative called “Szlachetna Paczka.” And the experience was so rewarding that there is no doubt in our minds that we’ll be on board as the initiative launches its 2019 edition. 2. After eight and a half years in a rapidly changing environment, we know how to grasp the opportunities that come our way and we are still growing faster than the market. But recently, there’s been some talk in the industry about an upcoming recession. Some claim that the global economy is due for a slowdown. We’re not specialists in the field by any measure and a lot of experts out there speculate that it’s bound to happen soon. As it is a possible scenario, we have to make plans detailing our potential response to such a course of events (and we did). But we’re quite calm. Why? Because we strongly believe that we're still the smart choice as a technological partner. Last year was proof that we can not only deliver meaningful, top-quality software while staying within budget and on deadline, but also have a crack team in charge of sales and marketing. We’re a feasible partner for SMBs, startups, and enterprises alike and, we know how to design our marketing efforts to reach our target audiences. Having this proper sales and marketing operation in place is extremely important to us. In good times, it’s something that allows to outpace the competition. In bad times, however, it will help us survive. Our engine is well-oiled. We’re ready. Looking forward to anything 2019 may throw our way. Our devs are so communicative and diligent you’ll feel they are your in-house team. Work with experts who will push hard to understand your business and meet certain deadlines.